captbrando's log » Blog Archive » Big day yesterday! « w00t! I’ve got clearance Clarence! Boy it sure was! We had our first sonogram of the baby (Chris is 10 weeks along) yesterday and we confirmed that there is really something growing in the baby oven! See if you can find its head and tail! What a humbling experience. 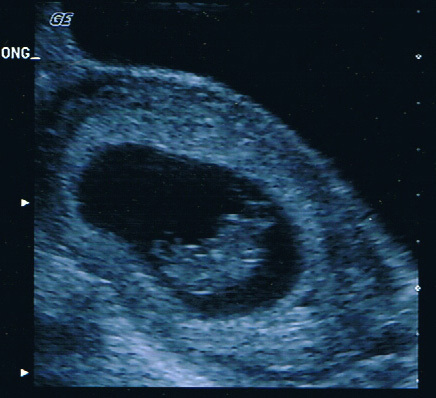 It was really cool to see that little dude (only 2.4cm at this point) wiggling around in there. Definitely put on a show just for us. Then about 4 hours after seeing our first kiddo, I graduated! MBA degree in hand. Another humbling experience for sure. You would not think going to a graduate graduation would be that big of a deal, but we had 95 people show up to grauduate and the sports center was just about full of people. I was glad to have my wife, sister and parents there as they screamed the loudest when my name was called. I got my hood, picked up my diploma and sat back down. We then had a little reception at the school and bugged out. Now after we have all recovered, Chris is off to work, I’m cleaning the house up a bit and our niece is coming up soon. She’ll nap here and then we’re headed over to Dave & Buster’s for some celebration fun. This entry was posted on Saturday, August 7th, 2004 at 7:51 am	and is filed under Tidbits. You can follow any responses to this entry through the RSS 2.0 feed. You can leave a response, or trackback from your own site.